• City Commission has adopted US41 North Trail revitalization as high priority. • US41 North Trail revitalization from 10th Street to 14th Street is integral to the Bayfront Connectivity plan approved by City Commission in 2010. • Jurisdictions compete for FDOT money and calendar funding position through the MPO (Metropolitan Planning Organization). The MPO has prioritized funding and construction of the US41 Multimodal Corridor from University Parkway through Orange Ave, – 4.5 miles – 10 modern roundabouts – at the intersections of University Parkway, 47th Street, Myrtle, MLK, 14th, 10th, Fruitville, Gulfstream, Main, and Orange Ave.
• MPO annually solicits projects for prioritizing, next cycle in first quarter of 2014. US41Momenutum is encouraging the City to submit US41 @ Ringling Blvd as modern roundabout for MPO funding as a priority project. • MPO sets funding priorities for FY 2015/16 -2019/20 and submits to FDOT in June 2014. The FDOT devises a work program for those projects and presents it to the MPO board for final adoption in December 2014. • The current FDOT work plan has the 10th Street to 14th Street multimodal corridor, with roundabouts, scheduled for completion in FY 2016/17. Actual construction could extend during the International Rowing Championships in September 2107. (US41Momentum is pressing the FDOT and FHWA to compress the usual process calendar to assure construction is completed in 2016, prior to the arrival of international visitors and media to Sarasota amenities. • Once prioritized by the MPO, City can “advance fund” to compress project calendar. The Sarasota City Commission has committed to advance funding whatever funds to complete US41 10th-14th in 2016. Funds advanced would be returned to the City by the FDOT at an agreed date. • City has impact fees and other funds on hand to complete US41 construction of the Fruitville Road & Gulfstream roundabouts – not dependent on MPO funding priority nor federal funds nor Federal Highway Administration (FHWA) process. • 2013 the Metropolitan Planning Organization (MPO) prioritized funding the US41 Multimodal Corridor (MMEC) from University Parkway south through Orange Ave. Since its construction in 1928 linking Tampa and Miami along Florida’s southwest coast and across the Everglades, the Tamiami Trail (officially US 41) has created a rich and unique historyby connecting people, places and economic opportunities. The road links port cities with markets, provides access to some of America’s most beautiful beaches, homes and resort destinations, and has enabled commerce to thrive in cities like Bradenton, Sarasota, Venice and Fort Myers along Florida’s Gulf Coast. However, that success waned in recent decades with widening and re-alignment to move traffic. Even more significantly, the construction of I-75 in the mid-1980s some 10 miles to the east redirected economic growth from the traditional downtowns and historic Tamiami Trail corridor to the interchanges and developments lining the interstate. 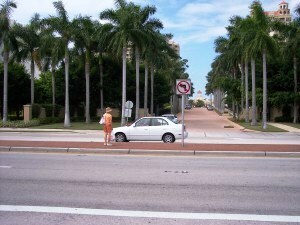 A pedestrian waits for traffic to cross US 41 in downtown Sarasota. Innovation 41 map showing corridor segments and nodes of targeted redevelopment. 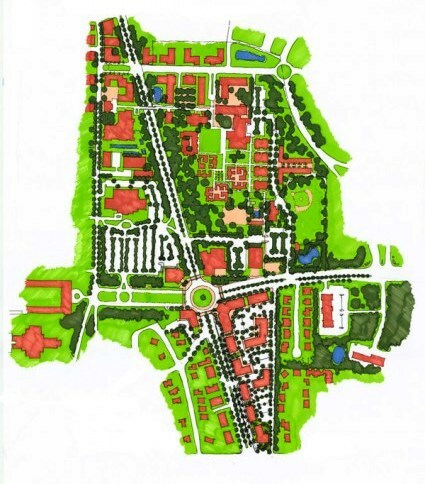 A cross-jurisdictional partnership of government, airport, education and cultural institutions combined efforts in 2005-06 to develop the US 41 Education and Cultural Corridor Master Plan. 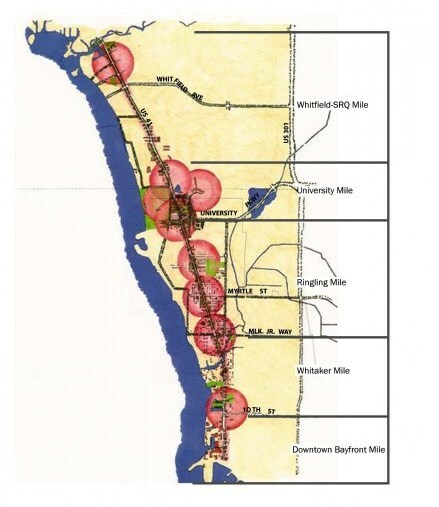 The plan’s mission was to create a public process and conceptual plan via an open community discussion on the branding, shape, form and substance of adesignated area of higher education, history and culture along the North Trailon US 41 between Bowlees Creek in southern Manatee County to just north of downtown Sarasota. Jointly funded by Manatee County, Sarasota County, the City of Sarasota, Sarasota Manatee Airport Authority, Ringling School of Art and Design, University of South Florida Sarasota-Manatee, New College of Florida and the Florida State University Ringling Center for the Cultural Arts, the Innovation 41 Master Plan created a vision for improved access, a greater user experience for cultural tourism and higher education, market-based redevelopment strategies to support the needs of residents, students, visitors and employees in the corridor. Corridor redevelopment plan for the Innovation 41 airport/Ringling Museum segment. Outcome: The Great Recession did the corridor and implementation of this plan no favors, but the Innovation 41 master plan reinforced the Tamiami Trail as the primary gateway to region’s cultural and educational treasures, downtown Sarasota and the beaches. The plan identified nodes and key access points for focused redevelopment that respects the culture and character of the area, its adjacent neighborhoods and destinations. It has also served as a rallying point for the higher educational institutions, businesses, cultural destinations, the airport authority, neighborhoods, advocacy groups and local governments for appropriate redevelopment and transportation modifications on the corridor. The plan identified nodes and key access points for focused redevelopment that respects the culture and character of the area, its adjacent neighborhoods and destinations. Importantly, it’s also served as a rallying point for the higher educational institutions, businesses, cultural destinations, the airport authority, neighborhoods, advocacy groups and local governments to advance appropriate redevelopment and transportation modifications. Whit Blanton, FAICP, Vice President RENAISSANCE PLANNING, is a founding principal of Renaissance Planning Group and serves on the Board of Directors of the American Planning Association. .121 South Orange Avenue, Suite 1200 Orlando, Florida 32801. ph. 407.487.0061 x113 c.407.620.5984. http://blog.citiesthatwork.com/.